The league’s most skilled shot blockers are certainly fun to watch, but are they effective? Although preventing a shot attempt appears to always be a positive thing, there is something to be said for solid interior defense without making the spectacular play. To try to answer the original question, I’ve decided to run a quick study using the lineup data at www.basketballvalue.com. The lineup data includes each different matchup of five players versus another five that took place during the 2008-09 season. First, I calculated the league average home and away Offensive Ratings. I then calculated the same averages for the lineups that were facing a top 20 shot blocker (based on blocks per 48 minutes). 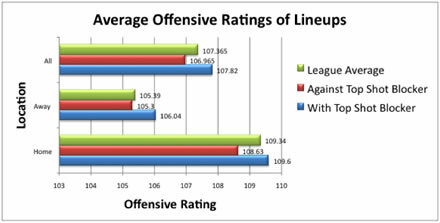 To see what effects those shot blockers had on their own teams’ Offensive Ratings, I calculated those averages as well. As you can see, having a shot-blocking presence does not appear to improve your defense considerably. This difference is only noticeable when your team is on the road. However, these numbers are largely influenced by Shaquille O’Neal, a top shot blocker who played on a team that both scored and gave up a lot of points, bringing the numbers back to average. Click here for the Basketball-Statistics.com archives! This contains all of my research going back to 2006.